Stevie Nicks, whose first studio CD in ten years, “In Your Dreams,” was released to critical raves and debuted in the Top Ten on Billboard’s Top 200 Chart is back on tour with a performance at New York’s legendary Beacon Theatre on Monday, July 2nd. Get the Best tickets first. Use your Chase credit or debit card to purchase Advance Tickets during this exclusive Chase Advance Ticket sale. Limited-time offer only available Monday, April 23 at 10am through Friday, April 27 at 10pm while tickets last. Public on sale begins Saturday April 28 at 10am and will be available at select Ticketmaster outlets and Ticketmaster phone charge 1-866-858-0008. Online at beacontheatre.com, livenation.com, and ticketmaster.com. Is there any chance of Stevie coming to Seattle in the near future?? $250!! New Yawkers are gonna luv that! "OOoooh, I hope she wears a black dress and sings 13 songs and does all the same Fleetwood Mac songs she does on all their tours!!" Shoot, making her entrance in Vegas, Cher FLEW (with wires, of course, I don't think C can fly on her own) across the stage to make her entrance at $50 less, in VEGAS. If Stevie ever ''flew'' across the stage, it would be hilarious if a broom prop was used! Some greedy prices, again. Good for her! 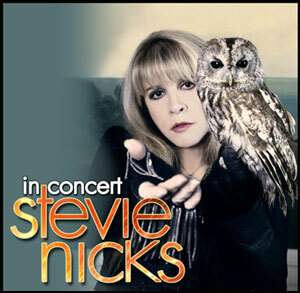 We are NOT Fleetwood Mac, but BELLA DONNA will be on tour this summer with songs you won't hear from Stevie!